S-CSCF | Windancer - Stairway to ...Heaven? Now, let’s analyze the messages from the IMS – SIP signaling. As I was saying, these messages are tunneled between the eNodeB and PGW via GTPv1-U protocol. Then they reach the P-CSCF and are forwarded in the IMS core. 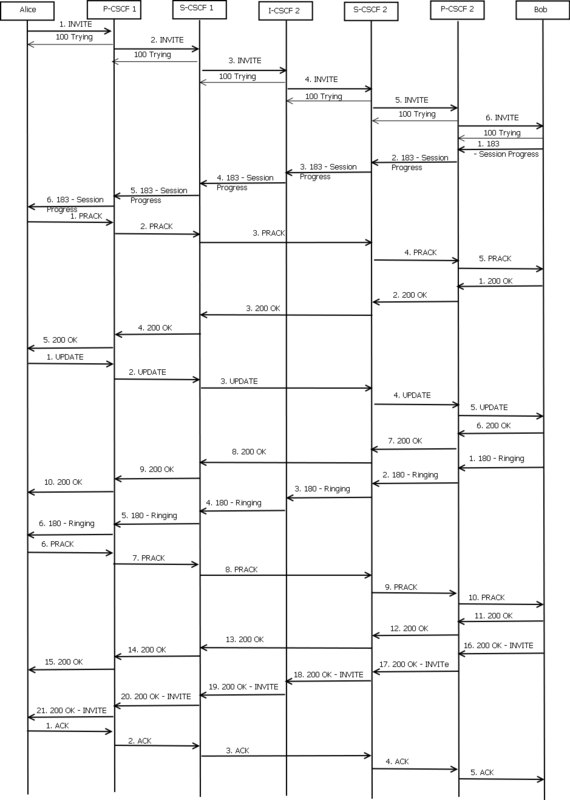 This P-CSCF entity, often called simply P, can be located – and usually it is, specially in the roaming scenarios, … located in the visited network. – As part of the establishment of connectivity towards the IP-Connectivity Access Network, if the IP-Connectivity Access Network provides such means. 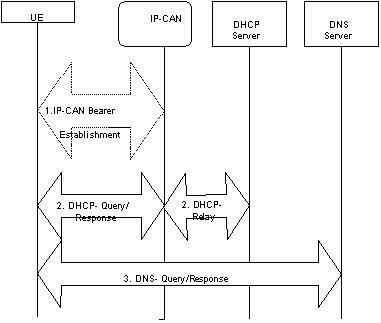 –Use of DHCP to provide the UE with the domain name and/or IP address of a Proxy CSCF and the address of a Domain Name Server (DNS) that is capable of resolving the Proxy CSCF name, as described below in clause 5.1.1.1. –The UE may be configured (e.g. during initial provisioning or via a 3GPP IMS Management Object (MO), TS 24.167  or in the ISIM, TS 31.103 ) to know the fully qualified domain name (FQDN) of the P CSCF or its IP address. If the domain name is known, DNS resolution is used to obtain the IP address. In the case where UE is aware of more than one P CSCF address, the selection shall be based on home operator configured policy to select the P CSCF. NOTE:Subject to home operator policy, the UE selects the Home P CSCF to be used by either using a pre-configured Home P CSCF FQDN or according to TS 24.167 . This can be done without the UE first performing the local P CSCF discovery (e.g. DHCP). The DHCP relay agent within the IP-Connectivity Access Network relays DHCP messages between UE and the DHCP server. 1.Establish an IP-Connectivity Access Network bearer if not already available by using the procedures available in the IP-Connectivity Access Network. 2.The UE requests a DHCP server and additionally requests the domain name and/or IP address of the P‑CSCF and IP addresses of DNS servers. It may require a multiple DHCP Query/Response message exchange to retrieve the requested information. 3.The UE performs a DNS query to retrieve a list of P‑CSCF(s) IP addresses from which one is selected. If the response does not contain the IP addresses, an additional DNS query is needed to resolve a Fully Qualified Domain Name (FQDN) to an IP address. After reception of domain name and IP address of a P‑CSCF the UE may initiate communication towards the IM subsystem. 1. During Initial Attach/PDN Connection Request, the UE indicates that it requests a P‑CSCF IP address(es). 2. The MME sends a Create Default Bearer Request to the S‑GW. 3. The S‑GW forwards the request to the P‑GW and the P‑GW gets the IP address(es) of the P‑CSCF(s). The mechanism to do this is a matter of internal configuration and is an implementation choice. 4. 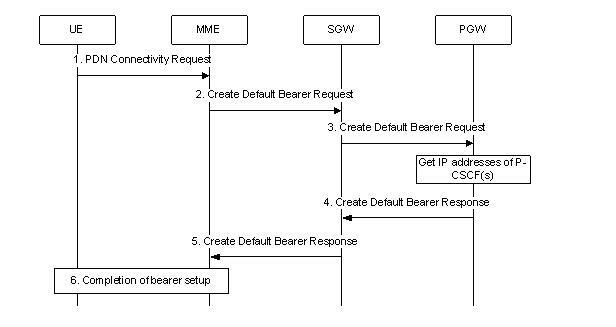 If requested by the UE, the P‑GW includes the IP address(es) of the P‑CSCF(s) in the Create Default Bearer Response. 6. Completion of procedures, as described in TS 23.401 . 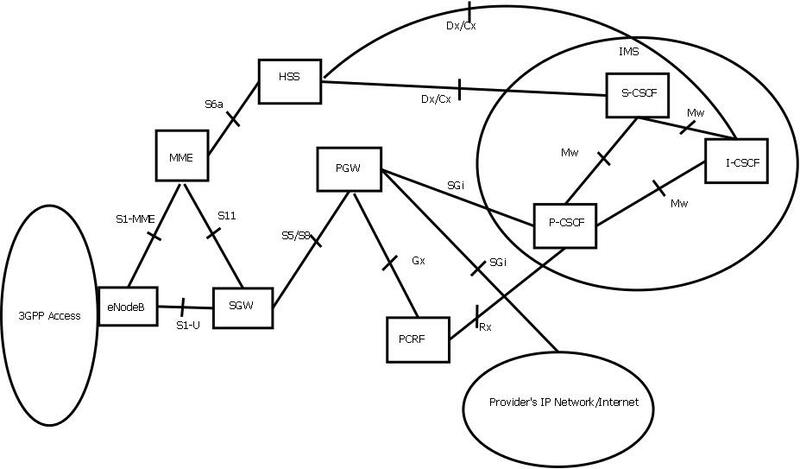 After reception of the IP address of a P‑CSCF the UE may initiate communication towards the IM CN Subsystem. Once the IMS terminal obtains its IP address, it must register to the IMS network. This happens in order for the UE to authenticate and obtain authorization to use the IMS network resources. The IMS registration is accomplished by the SIP REGISTER message – this being also the only SIP message that is authenticated by the network (subsequent SIP messages, like INVITE, 200 OK…and so on, are not being authenticated). First of all, we should know that the IMS-SIP is a SIP (RFC 3261) on steroids (as my SIP colleague use to joke 😛 ), because it has a lot of 3GPP enhancements to meet the 3GPP requirements for this type of communication – I won’t get into details right now. One requirement is that, in IMS, unlike in regular SIP, a phone cannot make any call without first being registered to the IMS network. Second of all, let’s establish the meaning of this “register” procedure. What the REGISTER procedure does is bind the public URI of that IMS user to a certain IP address and/or host name. The IP address/host name are the ones given by the IP-CAN Session during attach or later on. It is the means of locating that phone in the network. The point is to let the IMS network know at which actual address (IP/host name) it can find a user it has configured as subscriber. 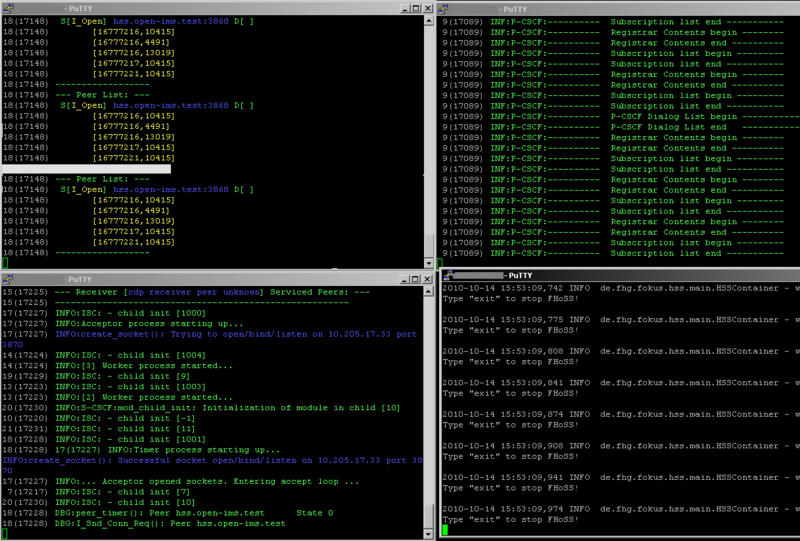 (i) both the IMS terminal and the P-CSCF upload to each other the algorithms used for compression of SIP messages. Before creating the SIP Register message, the UE terminal retrieves the Private User Identity from its ISIM card, along with its Public User Identity and its home network domain URI. 1. The first line identifies the method, which is REGISTER, then it is followed by the Request-URI. 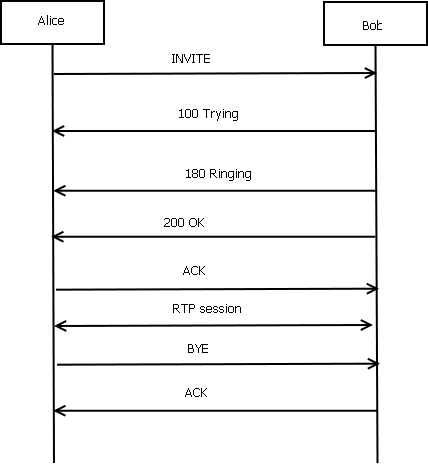 This Request-URI identifies the destination domain of the Register request. 2. The Via header is the IP address ( here: 5555::aaa:bbb:ccc:ddd) given to the UE during the initial attach or bearer activation, statically or dynamically (IP-CAN) assigned. 3. The P-Access-Network-Info represents the access type and information related to the access network, in our case, a 3GPP 4G network – LTE wireless, FDD, with the specified cell id. 4. The To: and From: fields are usually taken from the USIM. These fields have the same value in the Register message, representing the Public User Identity, also called Address-of-Record. This is the identity the other parties know and use to contact this UE. 5. The Contact: header represents the temporary point of presence for this UE. Its value is the most recent IP address the UE has and this address is stored in the S-CSCF. This is the third important parameter about the UE, the Contact Address (the other two being the registration URI and Address-of-Record). 6. The Authorization field caries out authentication information about the terminal. This information is the forth parameter used for registration, having the role of the Private User Identity. This value is the equivalent of the IMSI field in the GSM system and it should not be displayed to the user. It is used by the AKA fields to authenticated the user. This parameter is composed by the private ID and the domain name of the home network where the UE registers. The nonce and response parameters are empty, because this case considers the terminal has just been turned on for the first time, otherwise there should have been some cached information to send here. 7. The Security-Client field lists the algorithms supported by the UE. In this case, the terminal has IPsec capabilities. 8. The client requires the parties to agree on its security parameters and also indicates it supports the Path header. 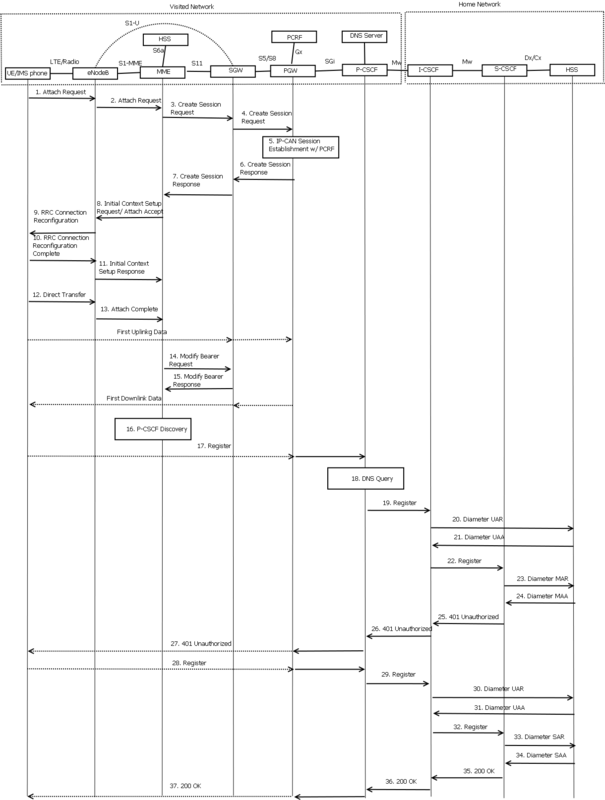 Before moving on to the DNS query functions of the P-CSCF, we should know that usually the P-CSCF is not located in the same network as the home network of the UE. This is why it is very possible it does not have an entry point into the user’s home network. Still, in order to be able to serve this UE, the P uses information from the user in order to locate the I-CSCF from the home network. This procedure is a DNS query specified in RFC 3263 and its purpose is to give this P a SIP URI of the home network I. After the P locates this I, it will forward the REGISTER message to the I, inserting along a P-Visited-Network-ID header that identifies the location (domain name of the network) of the P.
This P-Visited-Network-ID is necessary so that the home network verifies it actually has a roaming agreement with the visited network. Also, the P-CSCF inserts its own SIP URI into the Path header, so that the I-CSCF knows where to forward the reply. It is important that the Path header is populated, so that every request from the home network is forwarded via this P-CSCF visited network proxy, otherwise the requests will never reach our roaming subscriber. This is a continuation of the 4G – IMS topic I’ve started a while back. I would like to show a preview of the Specs describing this fancy IMS thinggie. And now, let’s get down to business.